My children were out since late morning, house hunting for the newly engaged (Ryan and Valerie), and they left the dining venue to me. By late evening, Vanessa texted me that they were almost done with the last viewing and ask where the venue for dinner would be. Erhm… Truth be told I haven’t planned but I remembered Adrian Aw Yong’s posting a promotion from Ju Feng a couple of days ago and called to ask him if the promo was still on. 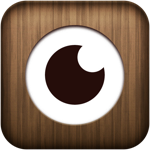 Grrrring…. 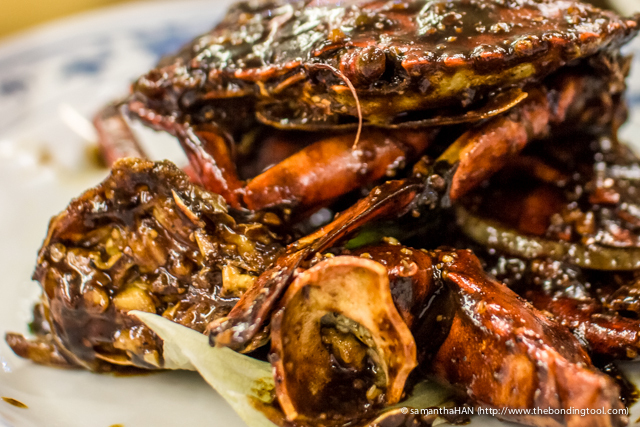 Ryan loves crab and Ju Feng had a crab promotion for their new location – 2 crabs for S$25 and 3 crabs for S$29. That’s a ridiculously good offer! We had to go for it! The children had not eaten at Ju Feng Garden Kitchen before. 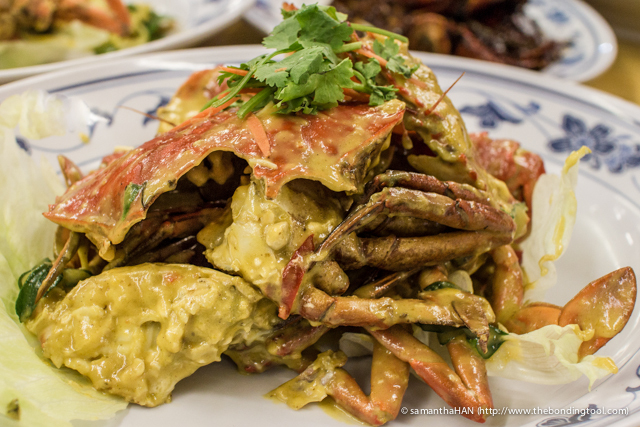 They had not had any good cze char lately and I was hoping that Ju Feng with it’s crab offering would satisfy them. My children were getting impatient about getting an answer from me, “Where are we eating?” They were very hungry by now. I didn’t answer that direct question as I couldn’t. From my previous experience, the food was very good but this time, Adrian had dutifully informed me Ju Feng has a new and very young chef. “There’s a crab promotion and Ryan loves crabs and it’s nearby so we’ll go there. Call you once I’m in the cab.” I hung up the phone. Adrian called again and gave me the good news. He managed to get some crabs! Phew!!! The kids didn’t know I knew Adrian and were surprised that I was familiar with the lady boss Mdm Zhao (Adrian’s girlfriend’s mother) when we finally reached there. 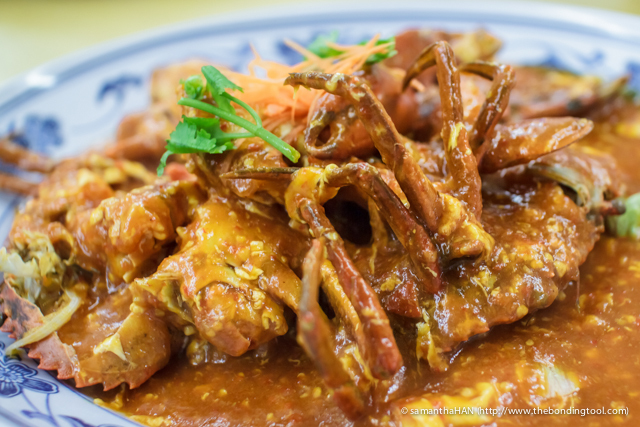 We decided on 6 crabs (2x promo) with 3 flavours and ordered more dishes with rice. 美味豆腐 (Delicious Tofu) – S$8 for small. 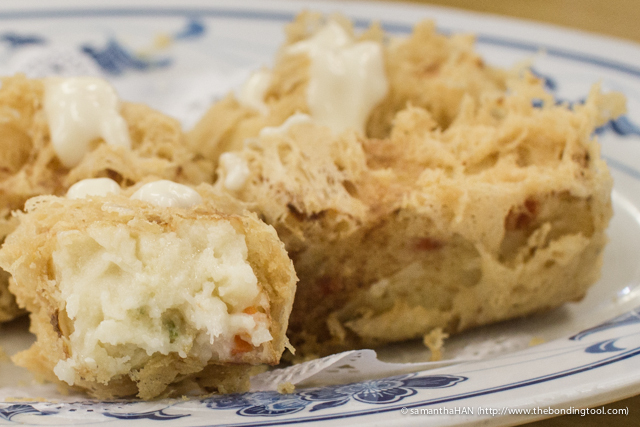 Homemade Tofu deep-fried till golden. 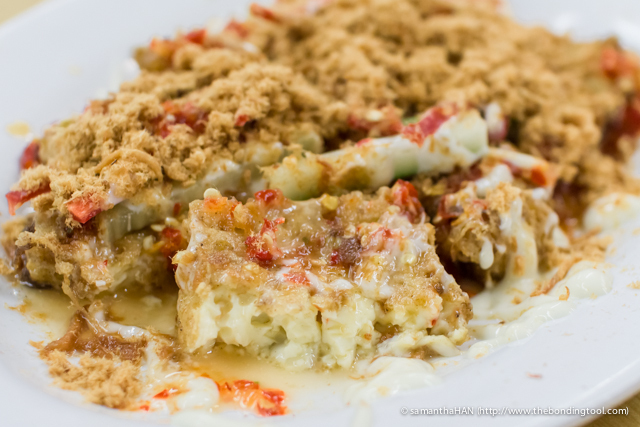 Topped with Thai Sweet Chilli Sauce, Pork Floss, red-cut Chillies, shredded Cucumbers and Mayonnaise. Crisp on the outide and creamy smooth on the inside. 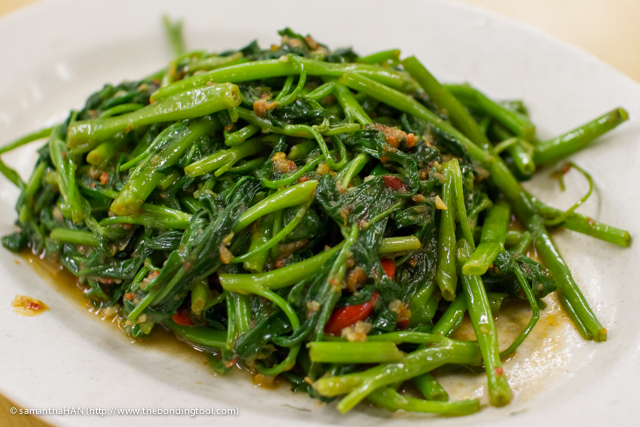 Sambal Kangkong (medium) – S$9. The spice level and seasonings were well balanced and the greens retained its crunchiness. 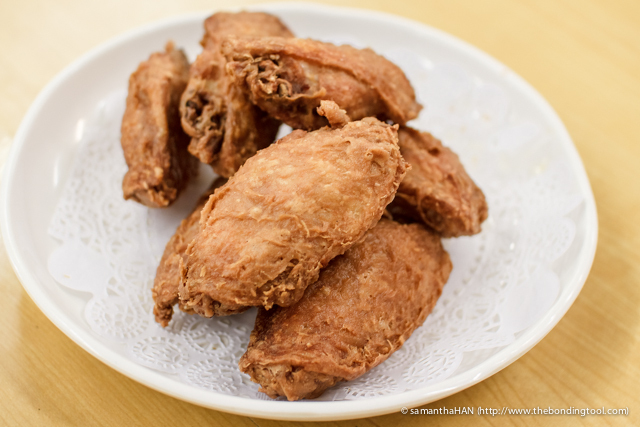 虾酱鸡 (Har Jiong Gai – small) – S$8 for 7 pieces. Chicken seasoned with fermented shrimp paste. 虾酱鸡 is a favourite item on cze char menu and Ju Feng did this dish very very well indeed. As you can see, these wings weren’t greasy at all. They were crisp perfectly and the taste was not overly salty from the fermented shrimp paste. The crispiness retained well when I had the last one which had cooled down significantly. 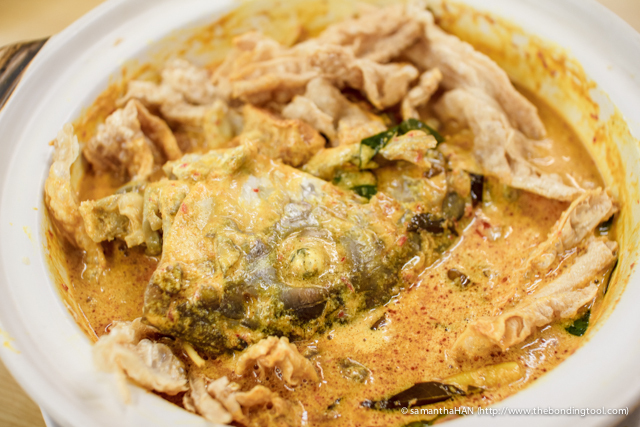 Curry Fish Head – S$24. Curry Fish Head is a local favourite.The fish head was very fresh due to the fact that each and every fish, seafood, were handpicked by the boss or Adrian which they buy from the Jurong Fishery. 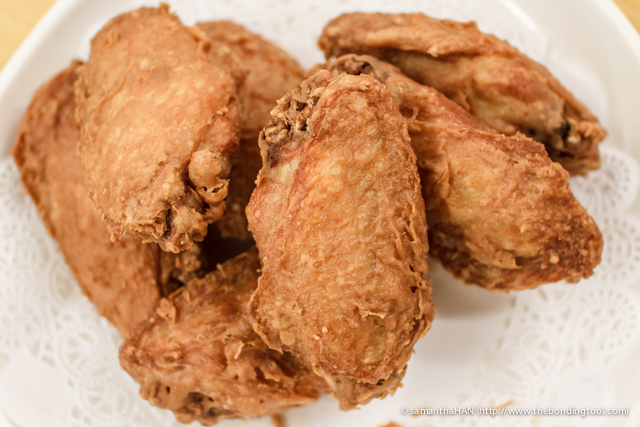 Fresh and tender meat infused with homemade curry powder and not store bought. Originally, we ordered 6 crabs but someone ordered two and there was one crab left so we took the last one as well. 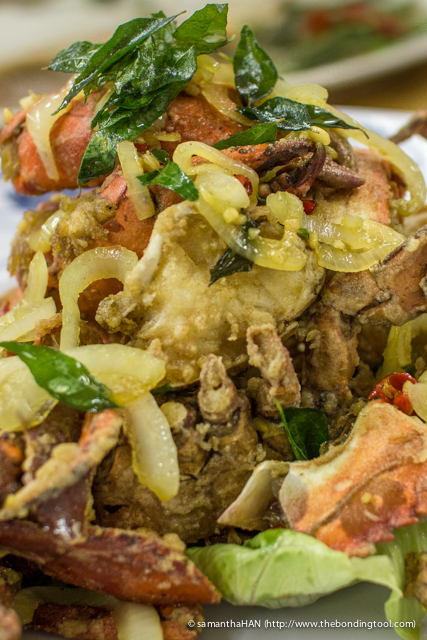 This is a uniquely Singaporean dish that has become very popular in the international scene. 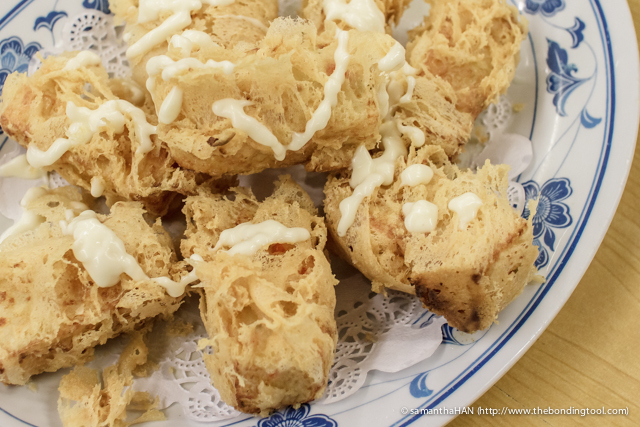 Butter Crabs.The children loved it.I learnt that they have another style – Butter Cream (Nai You), which I must try next time! Mdm Zhao had originally wanted me to try this but forgotten to cancel my earlier order of the “Delicious Tofu” dish. She realised her mistakes and quickly served this Special Tofu with Prawns. This is Ah Liang’s (the young cook) own creation. They had very interesting refreshing and crunchy texture. 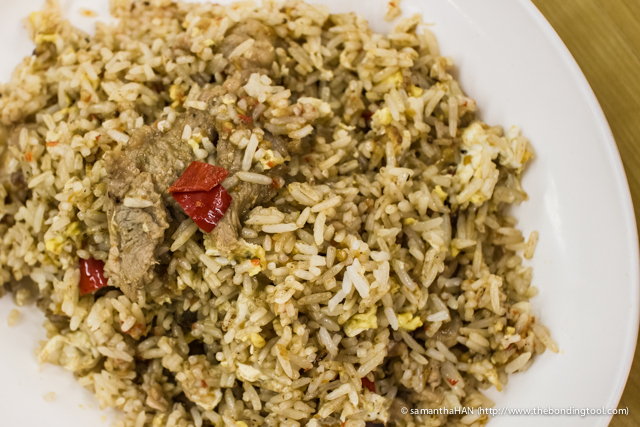 Sambal Beef Fried Rice (small) – S$5.50. We were not sure if they had this on the menu but there was no brow raising when I placed my order. Fluffy soft grains of rice with tender slivers of beef. My children were impressed with every single dish so I had to interview the young cook, Ah Liang (24 years old). Ah Liang is from Johor Bahru and worked as assistant in a Malaysian restaurant at the age of 15. He started taking over the kitchen at age 20 and has been woking, steaming and stir-frying in Singapore since. Ah Liang, Mdm Zhao and I.
Ah Liang also cooks the Economic Rice dishes (some 30s items) in the day. Choose any 2 vegetables and 1 meat to go with your rice and the cost? S$2.70! In Central Business District area? Yes, you can get cheap and delicious food still. 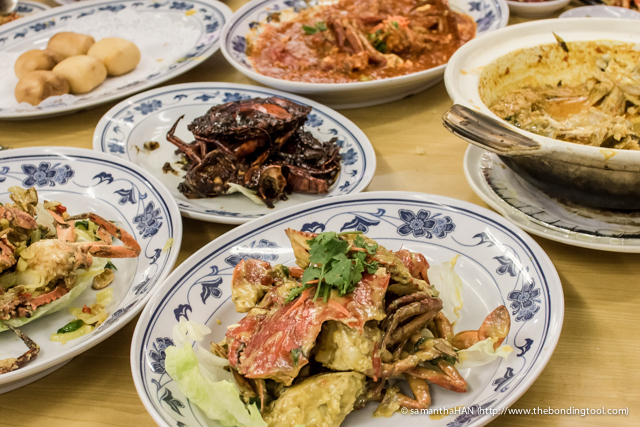 7-crab meal plus miscellaneous dishes totaled S$128. Don’t you think you should head down there now and try the dishes for yourself? 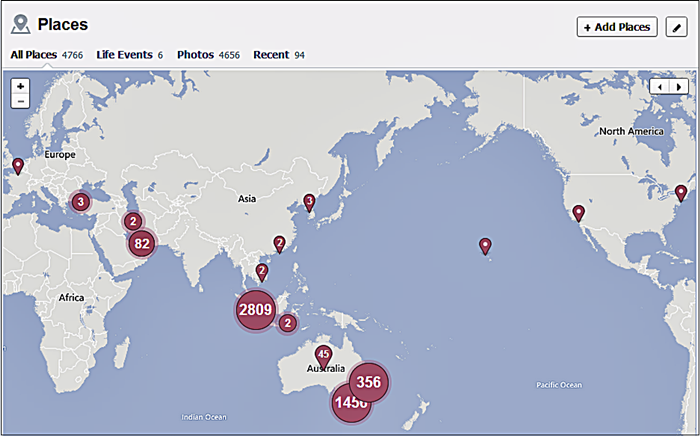 Date of visit: 13th April 2014. Photo courtesy of Adrian Aw Yong. The crab promotion lasts as long as this banner at the shop is flagging in the air. We loved the food and service here! I doubt we were given special treatment which they wouldn’t do for others. I know these people and know that kindness and politeness are in their nature. That’s just how they are, sincere. I told Adrian I was very happy with Ah Liang’s cooking and would do a post on tonight’s meal. Guess what he said? Economic Rice starts from lunch till early evening. 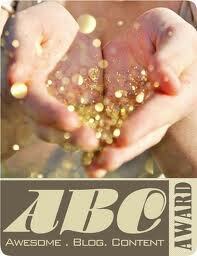 Address: Blk 318 Jurong East Street 31 #01-40 Singapore Singapore (7 minutes walk from Chinese Garden MRT station). P.S. Ju Feng just moved to Tanjong Pagar about 2 weeks ago. Perhaps we were lucky to have ordered all the right dishes but it is rare to find a cze char stall where everyone at the table agree that every single dish was well executed. Don’t just take my word for it. I notice you haven’t invited me to go on any of those fun food trips you keep going on, Sam!! !